Find the reflection strategies that work best for you in the comprehensive at-a-glance compendium, complete with its own table of contents. Use end-of-chapter comprehension questions to assess and reinforce your understanding of each chapter's topic. Conduct a self-audit to determine your level of competence for each of the 41 elements of effective teaching. Continue to develop your instructional practices with an appendix of teacher scales for each reflective practice. 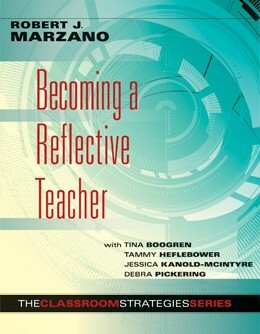 Relate to and draw from classroom vignettes that depict and explore the presented reflective strategies. “It is with the greatest enthusiasm that I share my endorsement of the ‘cannot-be-published-soon-enough’ text, Becoming a Reflective Teacher. The content integrates and reflects the depth, breadth, and longevity of research on teaching and learning. Truly, it is both research-based and grounded in and for practice. 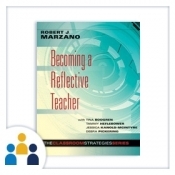 “Firmly grounded in both research and practice, Becoming a Reflective Teacher offers an enormous volume of specific strategies and tools for addressing reflective questions aligned with specific dimensions of effective lesson design and teaching practice. This book is an invaluable resource for all teachers in their quest to continuously advance teaching practice and student learning. 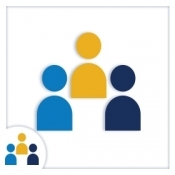 It will serve well as the focus of study with immediate application by individual teachers, collaborative instructional teacher teams, and administrators who understand the centrality of reflective practice for continuous instructional improvement.